Happy President’s Day Weekend, My Dear Readers! Our January is always a huge hit…we usually double, triple, or octuple-book ourselves for multiple weekends in January. What can we say? Utah, our fine Utah, furnishes us the entertainment by bringing us the Sundance Film Festival, one of our 2 Outdoor Retailers Annual Conventions (come back, come back!!! ), epic snowstorms (okay, maybe not this year…YET! ), and a slew of domestic and international travelers coming to see our glorious state. We LOVE this flurry of activity…our only wish is that it would continue throughout the year, keeping us flush in celebrities, genius sports equipment promoters, and stellar food and drink Monday through Sunday! In true Pierpont Place and Premier Event Services’ style, we hosted a plethora of STUNNING events for all of these great party-makers this year! For a one night fiasco to kick off our January 2012, we welcomed two incredible Outdoor Retailers parties in one night. At Pierpont Place we had our favorite neighbors: The local and newly branded eXperticity (previously SwarmBuilder), along with the children companies 3point5 and ProMotive – for a Outdoor Retailers after party with a theme of pure delicacy! Tunes spinning with DJ Fonik all night long — he kept us on our feet and moving to the beat while enjoying all that this party had to offer! High West Distillery, local to Park City, brought down some extremely delicious specialty drinks to pair with their trademark whiskey and vodka, served only in highest stylings through an ice decanter…we keep things chilly for eXperticity! Milcreek coffee provided some sensational chocolates…a perfect combination with High West whiskey if you ask me! 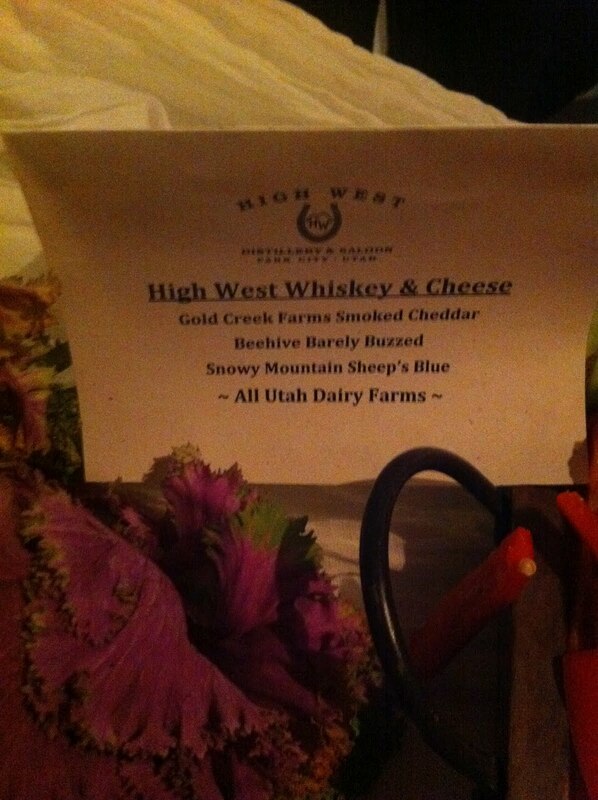 But not quite enough, because on the other side of the table we had “High West Whiskey and Cheese” giving us some of Utah’s homegrown (or home-churned) cheeses: Beehive Cheese’s lavender and espresso flavored cheddar, Snowy Mountain Sheep’s Blue, and Gold Creek Farms Smoked Cheddar. I’m sure you can’t blame me….I chose to hover around this table the whole night! So are you drooling yet?? Because it doesn’t stop here! Main Event Catering brought in a tantalizing pasta bar: choose your pasta, add your favorites — mine was an addictive penne with mushrooms, smoked salmon and roasted red pepper, freshly tossed in a light cream sauce, doused and browned with my vice…asiago cheese on top. My date had a sausage and chicken on rotini with spicy red sauce and browned parmesan…all made to order! So Andy from Main Event Catering…how about a daily dinner at 6 pm, bring all your ingredients, who wants to join?? Incredibly…this wasn’t even the most memorable part of the night! I got to sit with Patrick Purcell, Senior Marketing Manager of eXperticity, to hear a little about the rebranding of their company (detailed here) as well as the goals of their companies as they revel in the growth of their sports brand-based expertise here in the skiing mecca of Utah! eXperticity is committed to allowing retailers and brands reach their choice consumers on a knowledge and information based platform. As one of the children companies, 3point5 leverages a detailed training for sales people in the specific uses, creation, and goals of the product — information to be passed onto the consumer in their quest for the perfect product — guaranteed by a information test post-training before the sales begins! Approaching from the other side, ProMotive utilizes the availability of professionals (with skills to match) to wear or show the product in their field – exhibiting and explaining the effectiveness, appropriateness, and correct usage of the product while going about their normal business. eXperticity has been growing at an astronomical rate – not surprising when you recognize the type of people the company is comprised of. Patrick, for instance, is dedicated and passionate, explaining the business with a constant smile and a excitement usually reserved for things outside of work. The business model is solid, with a focus on allowing people to do, and work on, things they love. (Sounds a lot like what we do…lucky us!!) While eXperticity is perfect for the sports brands that flourish in the wild outdoors of Utah, I can already tell they will continue to expand outside this market – using the best type of motivation: knowledge and expertise, to show people what their clients’ brands are all about! Thanks for the killer party, eXperticity!! We can’t wait to host you again!! After the sumptuous delight of the eXperticity party, I ran across the city to the Outdoor Retailers after party for Rottefella, hosted by Premier Event Services at an offsite location. Rottefella was welcomed to Salt Lake City with open arms, as we hosted and boasted their excellent equipment – here’s to hoping Nordic Skiing is all the rage at OR next year!! For one night, we sure blew them both out of the water! We’re always willing to talk, so look up out stellar staff and reach out! Thanks for following, till next time!! The key to finding the right venue is thinking ahead and good planning. But firstly it is very important to establish the all over budget.